When mouse, dog, rabbit and monkey sit next to each other, do you think that they can agree on their tastes? Seemingly irreconcilable fixed dog teeth and tiny mice needles still have something in common. At least one flavor heats well both of them on their tongues. It is not bananas or cheese, but surprisingly honey, which everyone will gratefully eat. But as we know from Winnie the Pooh, honey supplies are limited. That’s why players assume roles of guards in card game Charly. Its creator is an experienced designer of children’s games Inon Kohn (Oink!). 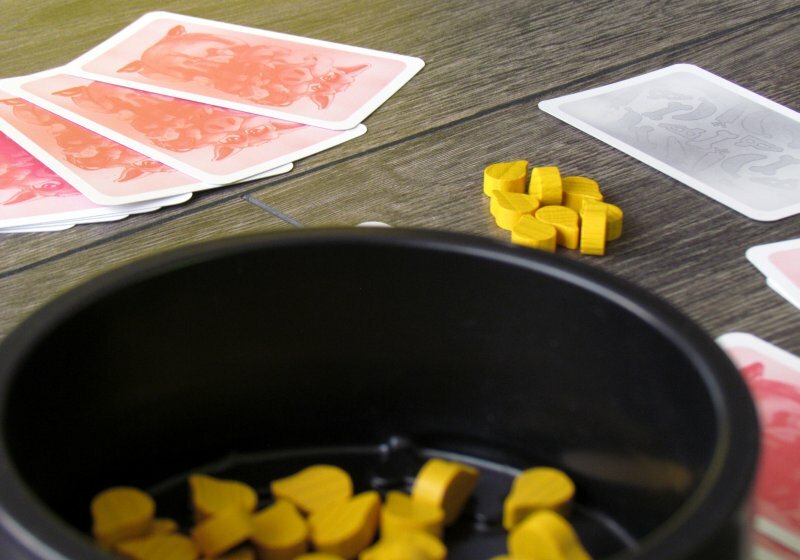 New game originates under auspices of Abacus Spiele. The game was released back in 2010, and illustrated by Patrick Korner. Rectangular box is not big, but it is surprisingly deep, just like stomach of title piglet named Charly. It arrives at the party, along with other animals and you have to prove to entertain. For all, which are not fed, there is a plastic dish to eat from. It will be filled with wooden tokens in the form of drops of honey to please every animal that is drawn on cards in the deck. Any such group of party visitors is different in size, which is also suggested by food icons in corners of the card. 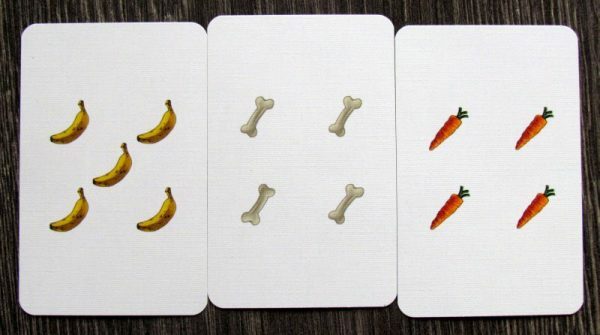 Other half of the deck represents actual food and again in different counts, whether in form of carrots, bones, cheese or bananas. At the beginning of the game, empty bowl is placed in the middle. 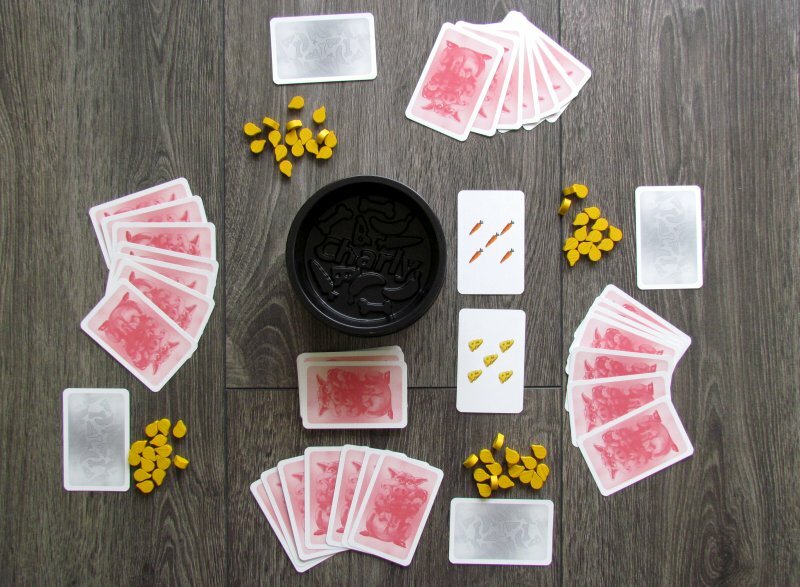 Each player then receives fifteen drops of honey, which will have to pacify empty stomachs of visitors, which did not get their favorite foods. 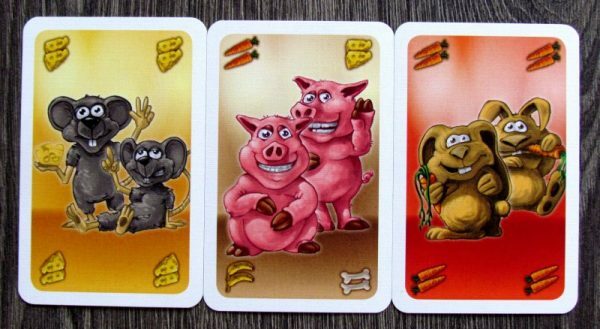 According to back of the card, players split them into two piles and each participant gets seven animals and one meal into his hand. From food deck more cards are revealed (depending on number of participants) into the middle of the table as current supply of food. Players will first in their turn try to restructure cards of animals in hand in order to improve chances of them getting fed. 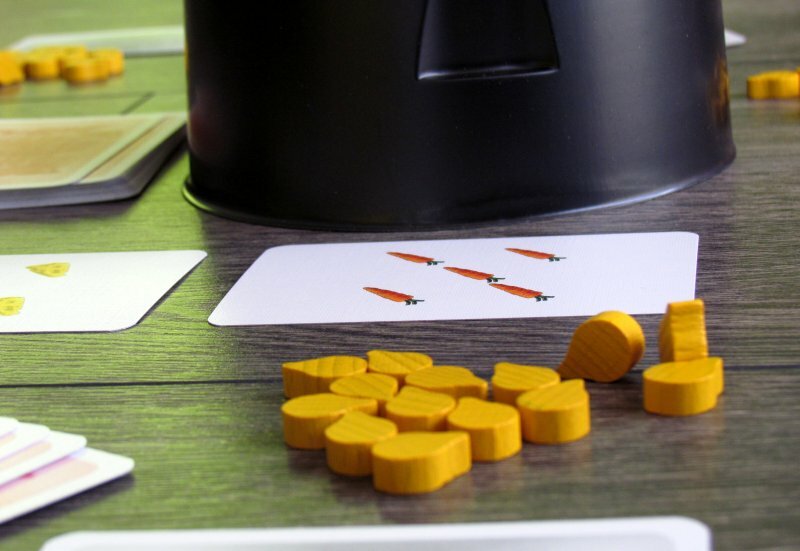 To do this, they can use open food information from three cards in the middle of the table and one secret food card held in their hand. All this food will be at the end of the round available for eating. 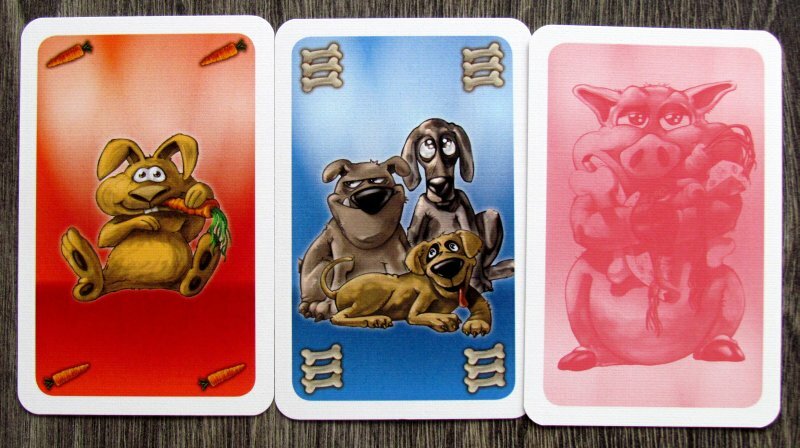 But first, each player can exchange one card from his hand for randomly drawn animal card from the deck or top animal from the discard pile. At any time during this phase, player might instead of changing cards report to other players, that he is hungry. 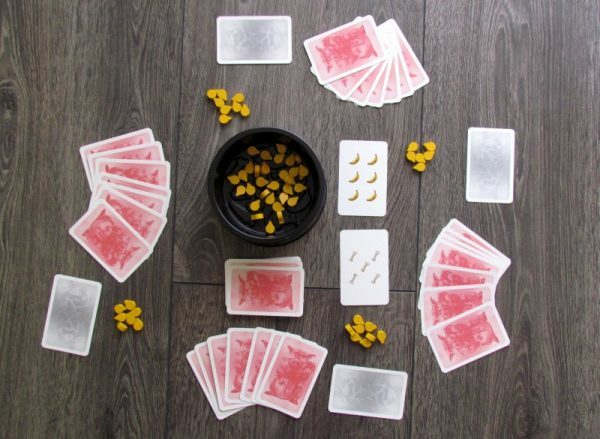 At that moment (as in the event of emptying drawing deck) players have opportunity to finish one round and invitations for animals to party ends. Now is the time to really cram their stomachs. 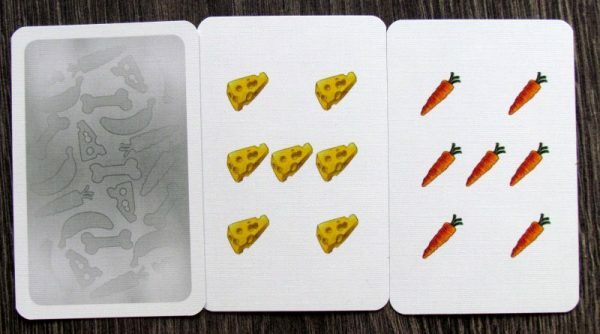 But first, each participant reveals his hidden food card (maybe a present he brought with him for the host) and attaches it to a group of revealed food cards. Players now start playing animals under food cards in playing order. Each table (card) may hold more cards from different players until a moment, when food supply is exhausted (number of food equals number of animals sitting there). Such a card is turned over. Gradually players get into a situation, when they no longer can feed any of their remaining animals. And for those, who remain in the hands, players will be penalized. Every animal that remains hungry on his card, player must discard one of his honey token. Game continues until moment, when one of rivals loses last drop of sweet nectar. 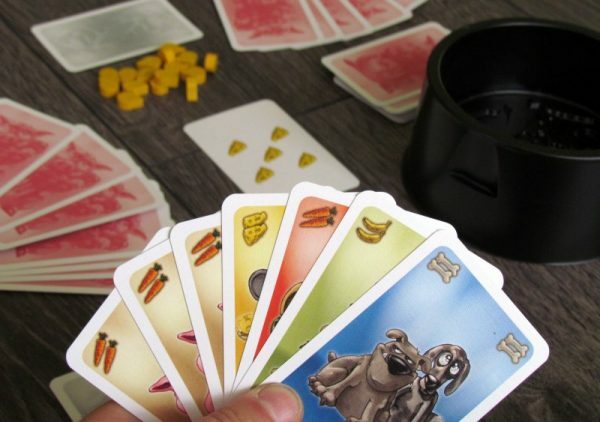 This player is clear loser, while winner is the one, who conversely owns most honey at the moment. 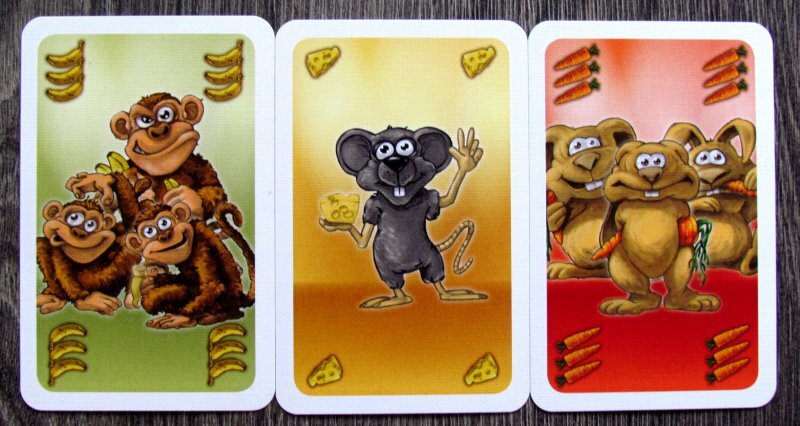 Charly is a card game, in which you will hear mostly stomachs rumbling. There is much more hungry animals, than can fit on the party. It is up to players to choose the right ones. It is their responsibility ultimately, that all invited guests have something to eat. Each of the party-goers have their favorite food. Except for piggy, who eats everything, even bones. Indeed, it corresponds to its reputation. Now to use these universal animals is key of successful players, if you get any piggies into your hands. With their use, you can easily block position of opponents, which is one of the most important tactical elements. As it is clear from last paragraph, a large part of success will depend on chance. 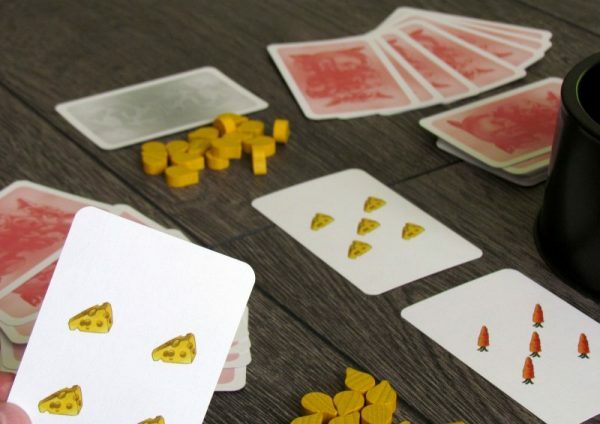 Players will get a random set of cards, and meals offer depends on luck as well. Thus, it can easily happen, that circumstances conspire against someone to the extent, that he will not have a chance of succeeding in actual round. This randomness makes Charly simple and fun and it clearly moves it into the role of family recreational games. 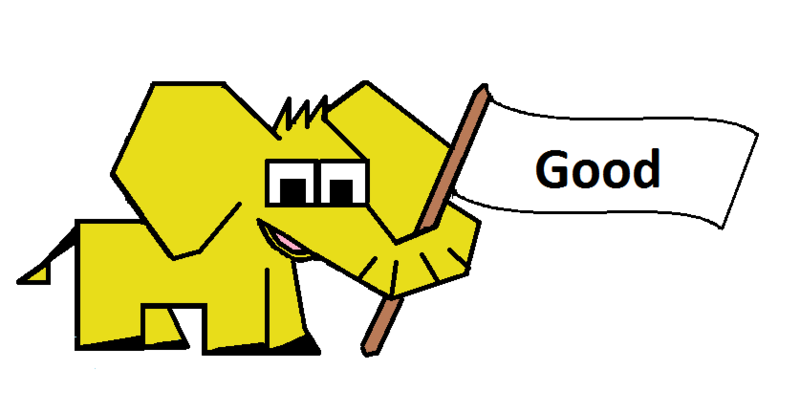 Although, one defeat in round does not make you a loser, so you do not have to worry about that. This classification works also for difficulty. Even children from six years will be able to feed the animals, but they need to know at least basics of numbers. All of them can then train adding, when playing cards to tables. In addition, game takes only fifteen to twenty minutes to complete. 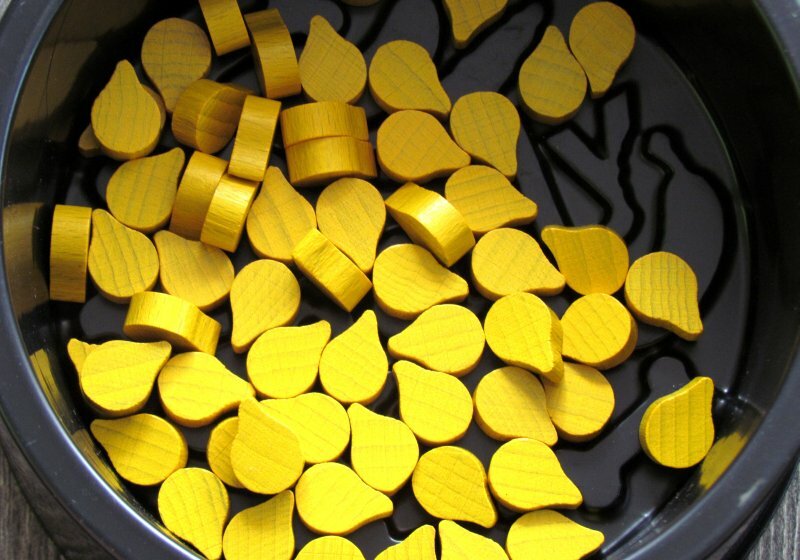 Shortening it by cutting down honey tokens is not advisable, because number warrants at least a slight decrease in the randomness of individual turns. Game is fun, especially when children play. Image processing is to blame. 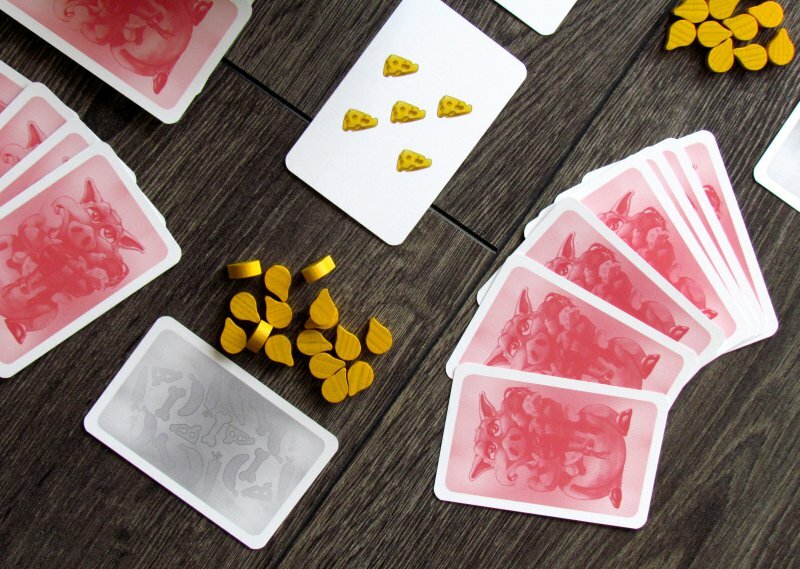 Cards and the situation in feeding is always clear, even because individual icons always remain visible. Charly is a card game that inspires and entertains mostly schoolchildren. In the game, it is also a little about tactics, especially because players have to work with what they get. 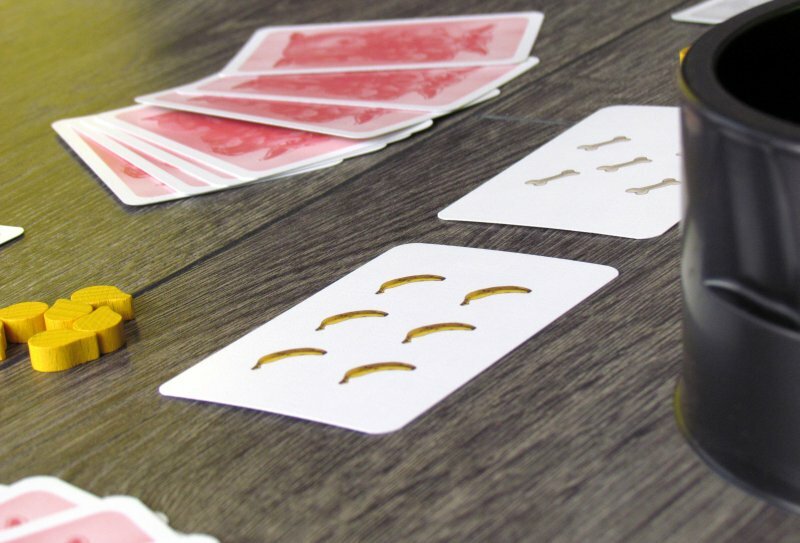 Cards may vary and anything can occur including you losing round after it has started. And any player might end actual round. It is therefore duel of patience. Charly is pleasant relaxing game that entertains especially children. 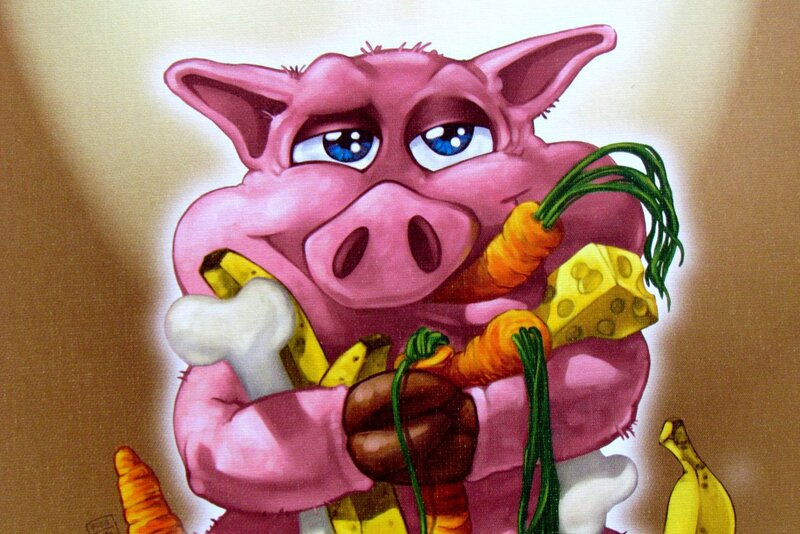 Charly is a piggy, on whose side is not only easy difficulty, but also a nice processing. This will certainly be appreciated by bellies of animals that need to be filled. 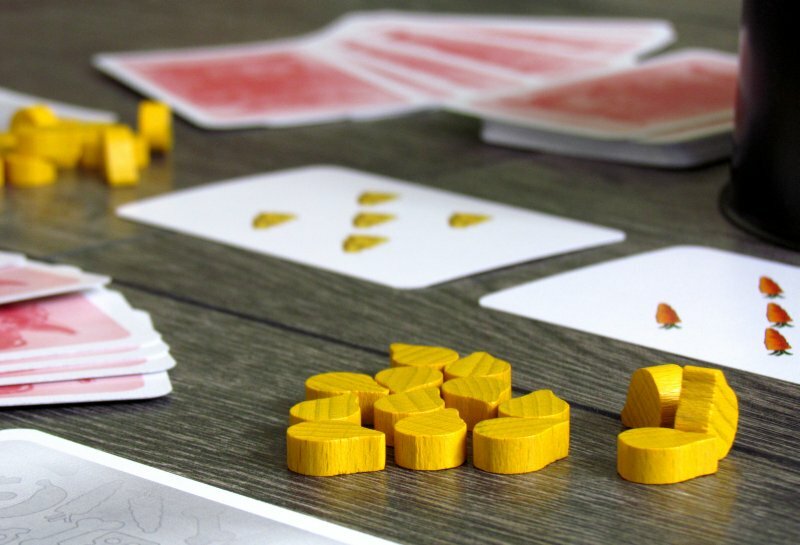 Players must first exchange cards that are dealt to them at the beginning. Only then can they invite animals to a party, where they already know a large part of meals offered. Only those visitors, who are not fed, will bring negative points and gets player closer to losing. Game is fast, exciting and easy. 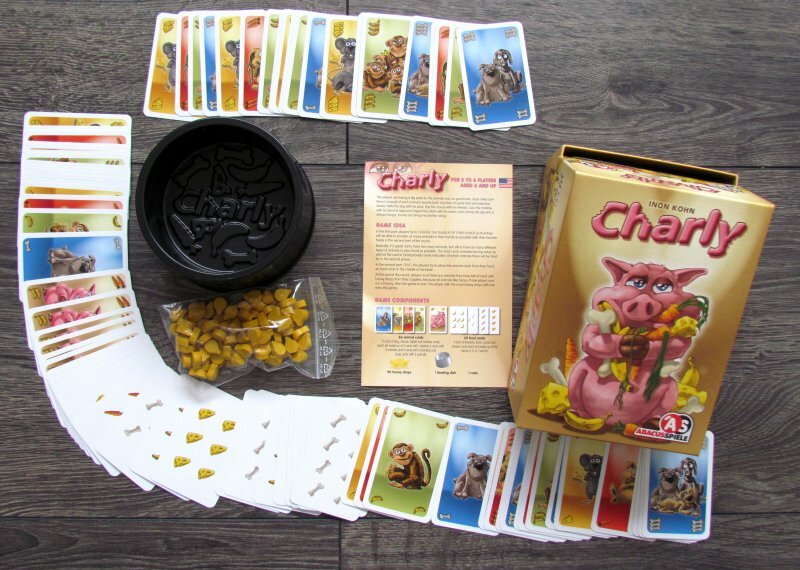 Charly offers fun that is appreciate by children and it works very well as a family fun as entry level card game.